The game between third ranked Aaguacateros (17-11) and seventh ranked Angeles (11-21) was the most important one in the last round on Saturday night. Aaguacateros were defeated by Angeles in a tough game in Puebla 76-82. It ended at the same time the four-game winning streak of Aaguacateros. Puerto Rican forward Carlos Lopez-Sosa (208-90, college: UNLV) orchestrated the victory with a double-double by scoring 18 points, 17 rebounds and 5 assists. American power forward Bryan Davis (206-86, college: Texas A&M) contributed with 22 points and 7 rebounds (on 10-of-11 shooting from the field) for the winners. 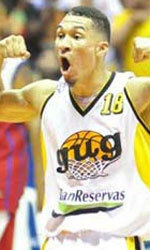 The former international power forward Arim Solares (202-83) answered with 15 points and 6 rebounds for Aaguacateros. Angeles moved-up to sixth place, which they share with Santos. Aaguacateros at the other side keep the third position with 11 games lost. Angeles will have a break next round, and it should allow them to practice more before next game. Aaguacateros will play at home against Panteras and it may be a tough game between close rivals. An interesting game for Lenadores (18-14) which played road game in against second-ranked Mineros (24-10). Third ranked Lenadores managed to get a 11-point victory 87-76. It was a great evening for American-Lebanese power forward Jarrid Famous (209-88, college: S.Florida) who led his team to a victory with a double-double by scoring 27 points and 13 rebounds. Stephen Soriano helped adding 11 points and 9 rebounds. American forward Nick Harney (203-92, college: Fairmont St.) responded with 25 points and 7 rebounds. Newly promoted Lenadores maintains third place with 18-14 record having just one point less than leader Fuerza Regia. Mineros at the other side keep the second position with ten games lost. Lenadores will play against Huracanes (#7) in Tampico in the next round. Mineros will play on the road against Correcaminos (#5) in Ciudad Victoria and hope to get back on the winning track. LNBP top team - Fuerza Regia (27-7) had no problems winning another game on Sunday. This time they crushed seventh ranked Huracanes (6-26) in Tampico 90-69. It was a quality performance for David Huertas who led the winners and scored 31 points. Martin Samarco came up with 19 points for Huracanes in the defeat. Fuerza Regia have an impressive series of eleven victories in a row. They maintain first place with 27-7 record. Newly promoted Huracanes keep the seventh position with 26 games lost. Fuerza Regia will meet at home Santos (#6) in the next round which should be theoretically another easy game. Huracanes will play against Lenadores and hope to secure a win. In the last two games of round 35 Correcaminos were beaten by Laguneros on the road 93-77. 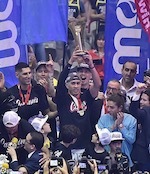 Panteras won against Libertadores on its own court 105-100. The most impressive performance of 35th round was 29 points and 5 rebounds by Tony Criswell of Panteras. Everything could happen in Torreon at the game between two tied teams. Both fourth ranked Laguneros and 5th ranked Correcaminos had identical 14-17 record. This time Laguneros used a home court advantage and beat the opponent from Ciudad Victoria 93-77 on Saturday night. Laguneros forced 22 Correcaminos turnovers. They looked well-organized offensively handing out 25 assists comparing to just 7 passes made by Correcaminos' players. It was an exceptional evening for Jamaican-American guard Akeem Scott (185-83, college: High Point) who led the winners with a double-double by scoring 20 points, 9 rebounds, 13 assists and 4 steals. American forward Mychal Ammons (198-92, college: S.Alabama) accounted for 23 points and 15 rebounds for the winning side. Scott is a former Eurobasket Summer League player, which is considered top international summer league in the market. American Theron Laudermill (202-89, college: CS San Bernar.) came up with a double-double by scoring 18 points and 12 rebounds and Barry Chinedu added 18 points (on 8-of-10 shooting from the field) respectively for Correcaminos in the defeat. Both teams had four players each who scored in double figures. Newly promoted Laguneros maintains fourth place with 15-17 record. Loser Correcaminos keep the fifth position with 18 games lost. Laguneros will have a break next round, and it should allow them to practice more before next game. Correcaminos will play against the league's second-placed Mineros (#2) and hope to secure a win. An interesting game for Lenadores (18-14) which played road game in against second-ranked Mineros (24-10). Third ranked Lenadores managed to get a 11-point victory 87-76. Lenadores players were unselfish on offense dishing 21 assists. It was a great evening for American-Lebanese power forward Jarrid Famous (209-88, college: S.Florida) who led his team to a victory with a double-double by scoring 27 points and 13 rebounds. The former international forward Stephen Soriano (200-85, college: Colorado Mesa) helped adding 11 points and 9 rebounds. American forward Nick Harney (203-92, college: Fairmont St.) responded with 25 points and 7 rebounds and American-Puerto Rican point guard Denis Clemente (183-86, college: Kansas St.) scored 16 points and 6 assists. Newly promoted Lenadores maintains third place with 18-14 record having just one point less than leader Fuerza Regia. Mineros at the other side keep the second position with ten games lost. Lenadores will play against Huracanes (#7) in Tampico in the next round. Mineros will play on the road against Correcaminos (#5) in Ciudad Victoria and hope to get back on the winning track. LNBP top team - Fuerza Regia (27-7) had no problems winning another game on Sunday. This time they crushed seventh ranked Huracanes (6-26) in Tampico 90-69. Fuerza Regia dominated down low during the game scoring 56 of its points in the paint compared to Huracanes' 18. Fuerza Regia had a 32-21 advantage in offensive rebounds. It was a quality performance for Puerto Rican swingman David Huertas (195-87, college: Mississippi) who led the winners and scored 31 points. American-Puerto Rican point guard Wilfredo Pagan (184-76) accounted for 12 points, 6 rebounds and 6 assists for the winning side. Four Fuerza Regia players scored in double figures. Naturalized American guard Martin Samarco (190-85, college: Bowling Green) came up with 19 points and American point guard Jeffery Stubbs (189-91, college: Jackson St.) added 13 points respectively for Huracanes in the defeat. Fuerza Regia have an impressive series of eleven victories in a row. They maintain first place with 27-7 record. Newly promoted Huracanes keep the seventh position with 26 games lost. Fuerza Regia will meet at home Santos (#6) in the next round which should be theoretically another easy game. Huracanes will play against Lenadores and hope to secure a win. The game between third ranked Aaguacateros (17-11) and seventh ranked Angeles (11-21) was the most important one in the last round on Saturday night. Aaguacateros were defeated by Angeles in a tough game in Puebla 76-82. It ended at the same time the four-game winning streak of Aaguacateros. Puerto Rican forward Carlos Lopez-Sosa (208-90, college: UNLV) orchestrated the victory with a double-double by scoring 18 points, 17 rebounds and 5 assists. American power forward Bryan Davis (206-86, college: Texas A&M) contributed with 22 points and 7 rebounds (on 10-of-11 shooting from the field) for the winners. Four Angeles players scored in double figures. The former international power forward Arim Solares (202-83) answered with 15 points and 6 rebounds and Eduardo Gonzalez (-89) added 13 points and 4 assists in the effort for Aaguacateros. Angeles moved-up to sixth place, which they share with Santos. Aaguacateros at the other side keep the third position with 11 games lost. Angeles will have a break next round, and it should allow them to practice more before next game. Aaguacateros will play at home against Panteras and it may be a tough game between close rivals. Rather expected game when 6th ranked Libertadores (11-20) lost to fourth ranked Panteras (16-16) in Aguascalientes 100-105 on Saturday. American players dominated the game. It was an exceptional evening for Tony Criswell (205-91, college: Missouri) who led the winners and scored 29 points and 5 rebounds. Forward Stedmon Lemon (198-92, college: Johnson C. Smith) accounted for 21 points for the winning side. Forward Anthony Young (200-89, college: Ky Wesleyan) came up with 29 points and power forward Gerard DeVaughn (206-88, college: Stillman) added 21 points, 7 rebounds and 5 assists respectively for Libertadores in the defeat. Both teams had four players each who scored in double figures. Panteras maintains fourth place with 16-16 record. Loser Libertadores keep the sixth position with 20 games lost. Panteras will meet higher ranked Aaguacateros (#3) in the next round and it will be quite challenging to get another victory. Libertadores will play against Abejas and it may be a tough game between close rivals.